Medical ID Bracelet with blue emblem. 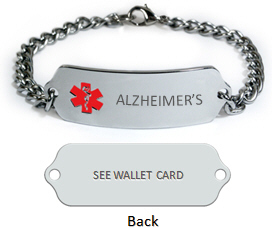 Alzheimer's Medical ID Bracelet, IDB56 (size 1-3/4" x 1/2"), is made from .062" thick premium Stainless Steel, and is hand polished to the mirror finish. It is guaranteed to be rust free for the life. Colored enamel medical Id logo is located on the left hand side of the plate. We have Red, Blue, Pink and Clear colors. The bracelet tag is slightly curved for wrist wear. Please choose correct length of the chain. If you are not sure about right length, please refer to suggested document: "How to choose appropriate length of the Medical ID Bracelet"
This Bracelet has ALZHEIMER'S condition engraved on the front and SEE VALET CARD on the back. *Please be advised that letters shown in black are for illustration only. They are NOT filled with black paint.